Snuff bottles were not originally made in China but were introduced into the country in the early 17th century by Fr. Matteor Ricci, an Italian Jesuit father. 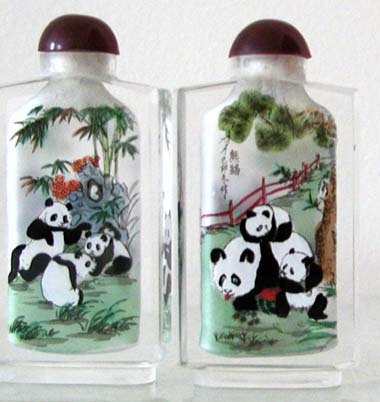 However, the art of applying interior painting to snuff bottles was born and developed in China and unique to the country. It is this particular painting that changed stuff bottles from mere "stuff bottles" to collectible forms of art. In the Qing Dynasty (1644 A. D. -1911 A.D.), the smoking of tobacco was not legally permitted, but to use it as snuff was considered perfectly acceptable, as it was believed to have medical benefits such as treating colds and headaches. The use of snuff and stuff bottles, however, remain to be a popular fashion among the upper classes. Stories have it that once, an official stopped on his way at a small temple for a rest and to take a sniff from his crystal snuff bottle. When he opened the bottle, he found it was already empty, so he used a slender bamboo stick to scrape off a little of the powder that had stuck on the interior wall of the bottle. Because the bottle was transparent, the bamboo stick left lines on the inside, visible through the crystal bottle. A young monk saw this and hit upon the idea of making pictures inside of the bottle. Thus a new art was born. During the 17th century, snuff became more popular among the Chinese, as was the demand for stuff bottles. With the perfection of the interior painting skills, stuff bottles changed from a mere container for tobacco powder to conversational pieces and collectable items. Collecting stuff bottle became a fashion, particularly among the rich and the upper classes. The finer the stuff bottle, the more respectable its owner. The “painting brush” used by the snuff bottle artist today is not very different from what the official in the story used. It is a slender bamboo stick, not much thicker but much longer than a match, with the tip shaped like a fine-pointed hook. Dipping the stick into colored ink, the artist uses the hooked tip to paint on the interior surfaces of a bottle and watches how the image goes from the outside. Snuff bottles are small in sizes, no more than 6-7 cm high and 4-5 cm wide, yet an accomplished artist can produce many delicate subjects on the limited spaces of the inside: human portraits, landscapes, animals, and calligraphy.